SAN LUIS OBISPO — Cal Poly dairy science junior Tony Lopes was named the first runner-up at the Young Farmers and Ranchers State Collegiate Discussion Meet on Feb. 25 in Modesto. Lopes, from Gustine, California, serves on the ASI board of directors and is president of the Los Lecheros Dairy Club. The California Farm Bureau Federation of Young Farmers and Ranchers is a program for agriculturists 18 to 35 years old who are actively involved in production and affiliated professions. Three additional students from the College of Agriculture, Food and Environmental Sciences also competed in the discussion meet: agribusiness junior Blair Brookes of Kelseyville, California; dairy science junior Amber LaSalle of San Luis Obispo; and environmental management freshman Mark Borges of Oakdale, California. Lopes and Brookes both advanced from the opening round robin discussions into the “elite eight” round. From there, Lopes advanced to the final four. The topic, immigration and agriculture, called for competitors to create solutions for immigration policy reform. Lopes was awarded $750. He plans to compete again next year. Cal Poly Agricultural Communication Professor Scott Vernon coached the team, with help from Megan Silcott, director of Cal Poly’s Brock Center. 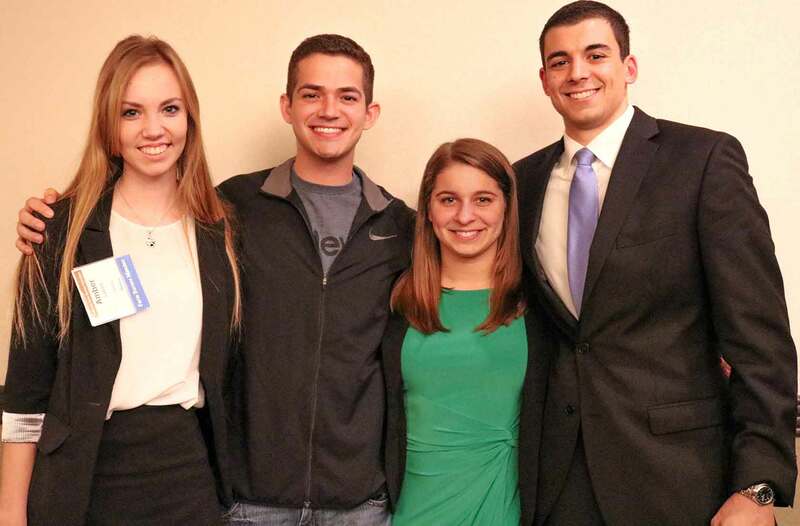 Pictured left to right are dairy science junior Amber LaSalle; environmental management freshman Mark Borges; agribusiness junior Blair Brookes; and first runner-up winner, dairy science junior Tony Lopes.